Fife Farmers Market in conjunction with Business Gateway Fife are calling for new food and drink businesses in the region to take advantage of a free opportunity that will allow them to showcase their produce to thousands of consumers across four popular farmers markets. 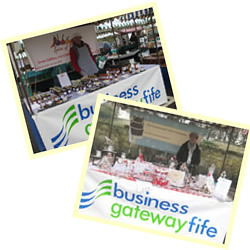 A partnership established in 2013 between Fife Farmers Markets and Business Gateway Fife allows start-up Fife food businesses free use of a sponsored stand at weekly markets across Fife for a three month period. Last year, three start-up food businesses ranging from cake producers to a maker of locally-grown chilli products used the stand to showcase their produce and test the market. All three have subsequently gone on to become successful businesses and regular Fife Farmers Market stallholders. New businesses wishing to be considered for this opportunity should be based in Fife and not have been trading for more than one year. Successful businesses are offered free use of the farmers market stand for a period of three months. Click here to find out more about Fife Farmers Markets, visit www.fifefarmersmarket.co.uk.